SP4 Steven A. Davis was a fourth generation soldier, he joined the Army in 2005 and he was assigned to the 2nd Battalion, 12th Infantry Regiment, 2nd Brigade Combat Team, 2nd Infantry Division based at Fort Carson, Colorado. 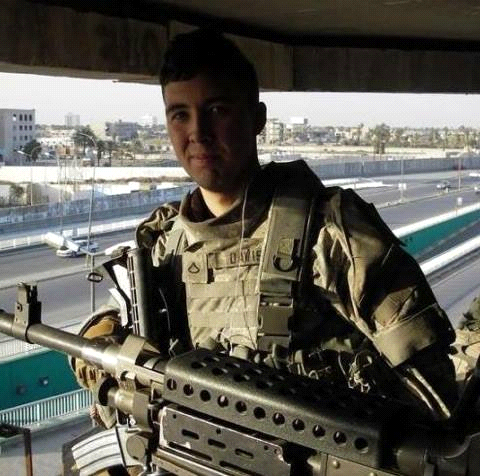 His unit deployed to the Dora Market area of Baghdad, Iraq when Steven was the gunner on the last vehicle in a four-vehicle convoy and was killed in action in a RG3K grenade attack on the 4th of July 2007. During Steven’s tour in Iraq his younger brother was serving with the 10th Mountain Division in Yusufiyah; his mother, Tess Davis, was a paramedic in the Green Zone and his grandfather, Rick Lara, was a DoD contractor at Anaconda as a mechanic. Steven was awarded the Purple Heart and the Bronze Star Medal and came from a family of soldiers and patriots. Steven was born at Womack Army Hospital in 1984, he grew up in the Fayetteville area and attended 71st High School. He played Ice Hockey as a defensemen for over 10 years for Cape Fear Youth Hockey, Fayetteville Jr. Force and the Fort Bragg Dragons. He enjoyed playing several different sports but his true love was always skateboarding. He could always be found trying some crazy stunt and was even arrested for riding his skateboard while visiting his parents in Northern Virginia. He is survived by his parents, his brother Christopher, his wife Ayla and his beautiful daughter Elizabeth Davis.